In the following we want to give you some information on the conduct of the tournament. All players who have booked via the EDF - webpage are automatically registered, as far as their names have been fully entered in the booking form. The Player-Cards are prepared for you and can be picked up on site. Persons who did not register, may not take part at the competition! This year Team Cup will be played as follows! To prevent unfairness in the grouping, all groups will start on saturday in a large 3 Round Robin Tournament. After completion of this round robin groups, the first will be set in Level A, the second in Level B. The 3rd placed are excreted, and can sign up for a Lucky Looser Team Cup. This competition is also your entry fee and can be played by all the dropped out teams. The teams have to be retained unchanged. In this competition, no excreted Team Cup PRO teams are allowed to play. With this method we want to prevent that strong teams intentionally let themselves fall into “Level C” to win the European Cup. On finalday will be played KO-mode for Level A, Level B and the Lucky Looser Team Cup. As in the past a team consists of 8 players at minimum. This year there is a separate women's contest with min. 4 players per team ! Depending on participation , we will also play round robin. Afterwards – if we got enough registrations - a knockout competition will be played! Also the so-called Team Cup PRO is played again this year! The most important change : it is played with at least 4 players (up to 8 players) . The teams have to pay an entry fee of € 80 , -. Of course 100 % of the entry fee will be played out! It is played in only one level, and therefore it can happen that teams are already dropped off on Saturday. Also round-robin groups are planned. IMPORTANT : In the Team Cup PRO only teams are allowed to play, who also play in the Nations Cup ! In general: Players may be registered only in one team! The 'Nations Cup' of men will also be done with 4 players (min . 4 , max . 8 ). The tournament committee reserves the right to punish extreme infractions. When setting the individual competitions we also take care, that players who soon drop out, will start as soon as possible in another tournament, to prevent that these players will struggle with 'big chunks'. This year this part will be controlled strictly. If a player registers for the next competition, although he is still playing in the main draw, he will be removed from both competitions! After the great success in the previous year, EDF will play also in 2018 a Steeldart Event with renowned PDC-Stars! This 8 Players are qualified for the PRO-Finals. They will be seeded for this finals. On 22 August there will be played a competition, where another 8 Players will have the chance, to qualify for the Steeldart PRO-Finals. Exact details about the mode will be announced, because of the amount of participants (KO or Double KO - bo3, bo5 or bo7). 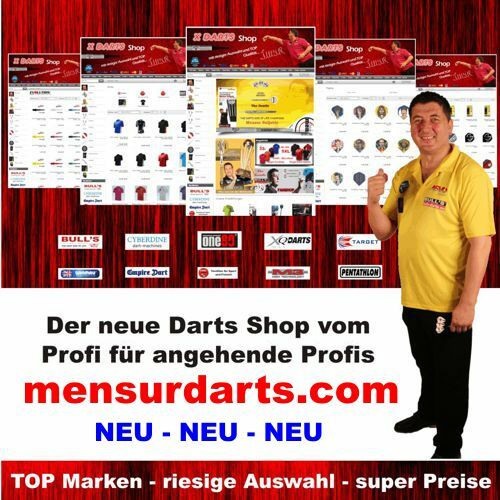 The 8 seeded PDC players and the 8 players from Qualifing-Event of Fryday will be drawn into 4 groups, where 2 pro's und 2 qualifiers be solved in each group. After Round Robin-Mode the first two players of each group will move up in 1/4-Finals. Than will be found a winner in KO-Mode. We hope, you will have much fun, to play against such renowned players. Price money must be picked up within an hour after the ending of the competition. The 3 winners will receive 50% of the prize pool and the remaining 50% at the awards ceremony. All other prizes will be paid fully and immediately! Price money will be paid on the next day from 12 am on (for 1 hour). The 3 winners will receive 50% of the price pool and the remaining 50% at the awards ceremony. All other prizes will be paid fully and immediately! We organize the team competitions on numerous requests on Wednesday and Thursday as a grand finale, the winners ceremony will be on Thursday, 29th August 2019 at 21 o'clock. This guarantees a great atmosphere and then enough time for party. FOR ALL WHO WILL BE A PART OF WINNERS CEREMONY, WE WILL HAVE A GREAT SURPRISE! All rights for changes are reserved for the tournament organizers. With these measures we hope to offer you event which will be remembered positively for a long time. 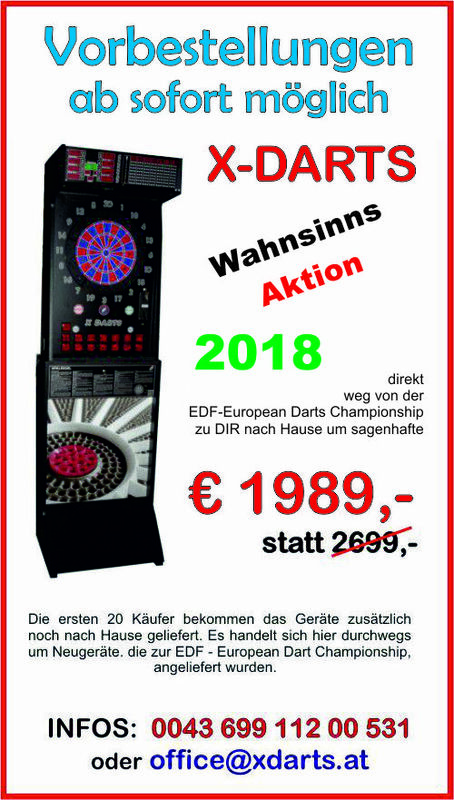 GOOD DART from your EDF team!